An ask on my Tails-n-Doll blog, from the illustrious TuneCharmer XD He found the ask/RP blog. 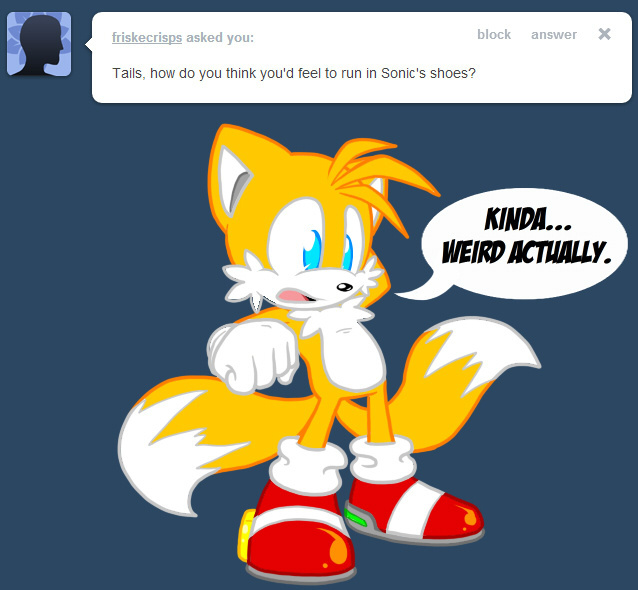 So here it is, Tails in Sonic's shoes feeling weird. I've been working out anatomy a bit more as well; official Sonic Anatomy I should say. I just dared Tails and the Doll to wave their butts at the camera. Hi. I just dared Tails and the Doll to wave their butts at the camera. Could be fun. Yes, do it! It'll be funny, I promise! Eeeeeh funny to whom though? XD; It's not really funny to me, honestly. Please? Do it for me??? Sorry. But you'll get to know me. I have a deviantART (CoreyAMurray),, and a Tumblr (corey-45). I live in Port Angeles, Washington, and am mildly autistic. I enjoy video games of all kinds. You'll still do it, right? I'm sorry, but that doesn't help me know you. That's just useless information given freely to a stranger. That's what we are, strangers. Besides I don't feel comfortable with it. Sorry. What will make you do it? What conditions must I satisfy for you to do it for me? Sorry. Uh... Do you know someone who might? Actually if I'm not mistaken, there was an episode of the old sonic cartoon that use to be on TV back in the 90's where Tails took Sonic's shoes and ran around as fast as he could. There was also Sonic Underground (personal fav) and Sonic the Hedgehog, also known as SatAM, which started the Sonic the Comics due to it's enormous cliffhanger and cancellation before continuing to a season 3.